Donald Trump says he is going to make America “great again”. That’s part of his campaign. What is greatness? Is greatness measured by money and armaments? If so, America is already great. It is the wealthiest country with the largest military in the world. If Mr. Trump wishes the country to be isolationist, he will need to withdraw or reduce 800 military bases in 80 countries and minimize the role of Wall Street in global markets. So why do workers at Walmart rebel over low wages when they helped make Walmart the largest retailer in the world? Isn’t it enough to take credit for helping America remain “great”? Why complain about wages? What are the differences between a “living” and “fair” wage to her? What each term means to one person might mean something altogether different to another. To a single twenty-two year old, for example, a wage that pays the rent on an efficiency apartment and can buy basic food and clothing is livable, for the time being. But to a middle-American couple in their forties a “living wage” means the ability to pay a mortgage, car loan, credit cards, cable and cell phone bills and save for their kids’ college education, at minimum. To ask a middle-American to live like a twenty-two year old isn’t “fair”. To ask a millionaire to live like a middle-American wouldn’t be “fair” either. And no billionaire should ever be confused with a mere millionaire or live like one; that wouldn’t be “fair”. Yet, each group makes a “living wage”. A food bill to a six-foot man who weighs 250 pounds is invariably higher than one for a five-foot slim woman weighing 115 pounds. Costs of rent or prices of homes and for clothing are determined by local and national competitive market forces. “Affordable” apartments, homes and clothing can be found within the marketplace to match a buyer’s income. A minimum “living wage” should pay for a domicile, food and clothing, as well as for transportation, phone, insurance and health care. Prices are determined by markets and purchase is determined by income. Wages are determined by negotiation between two competing entities: employer who seeks to maximize profits and employee whose needs require a basic “living wage”. When the water level rises all ships rise with it. When the minimum wage rises all wages above it rise. Therefore, it is in the interest of all workers and employees to increase the minimum wage; but it is not in the interest of profits. The Federal minimum wage is $7.25 per hour. Currently, 29 states and D.C. have adopted minimum wages above the federal minimum. Maine minimum wage is $7.50. In contrast, Vermont minimum wage is $9.60; Massachusetts is $10.00; and New Hampshire repealed their state minimum wage in 2011 but adopted the federal minimum wage by reference. Walmart raised wages twice in the past year and on January 20 announced new « hires » will earn « at least » $10 per hour bringing the average hourly wage to $13.38 for full-time workers and $10.58 per hour for part-timers. However, Walmart doesn’t release data about how many workers are full-time and how many are part-time. Is this wage scale a livable one, or is it merely “unfair”? What is a poverty wage and what isn’t? According to data presented by 2015 Annual Social and Economic Supplement (ASEC) reflecting conditions in year 2014, the official poverty rate is 14.8 percent; 46.7 million people are living in poverty. The poverty rate for children under age 18 was 21.1 percent in 2014. According to a February report by the Economic Policy Institute (EPI), nearly 30 percent of working Americans receive public assistance and almost half of these workers have full-time jobs. Of “low wage” workers who earn $12.16/hr. or less, over 53 percent receive public assistance. “Of the many policies that would lift wages, raising the minimum wage is the simplest way to help millions of low-paid workers pay the bills and ensure that businesses are doing their fair share to provide working families with the means to a decent life,” wrote the policy institute. It states even a modest rise in the federal minimum wage to $12 per hour by year 2020 would reduce public assistance spending by $17 billion that could be used to strengthen anti-poverty programs, new education initiatives or investments to boost the economy. On one hand, workers fight to increase the Federal minimal wage as shown in the « $15 movement » that has energized debate and helped push through dozens of state and local minimum wage policies; on the other hand, tax protesters and « small government » fiscal conservatives continue to fight against minimum wage increases at federal and state levels while promoting reductions in public assistance that help minimum wage workers. Caught between low wages insufficient to adequately support them and their families; declines in government assistance enacted by federal and state legislators; together with social stigmas politicians attach to those receiving public subsidies, 41.2 million working Americans (nearly 30 percent of the workforce) receive public assistance and represent a significant underclass largely disenfranchised from politics and marginalized by employers and government, and income classes above them. Forty-eight percent of home care workers rely on public assistance. In child care, it’s 46 percent. Among part-time college faculty – some of the most highly educated workers in the country – it’s 25 percent. Five days before Walmart instituted wage increases on Jan. 20, it announced it is shutting down 154 of its U.S. locations, affecting 10,000 workers who will either be laid off or relocated to a different store. The world’s largest company claimed wage increases will impact earnings this year. On a reported basis, Walmart’s fiscal year 2016 total revenue was $482.1 billion. The backdrop to everything occurring here and in the world is a planetary-wide one that most dismiss. While remaining Americans, we now are citizens of a globalized world. We account for only five percent of the global population. Remaining an economic and military powerhouse, we face a process of equalization that is occurring between the “haves” and “have nots” in America and the West; and a series of drama-inducing adjustments to the global shift or paradigm shift, if you will, that is creating a multipolar planet. There is no roadmap or compass to guide the way. We go with it and grow, or go against it and wither. But nothing is going to change the rotation of the Heavens, not even our national ego or massive nuclear arsenals. What will make America great? What is greatness? 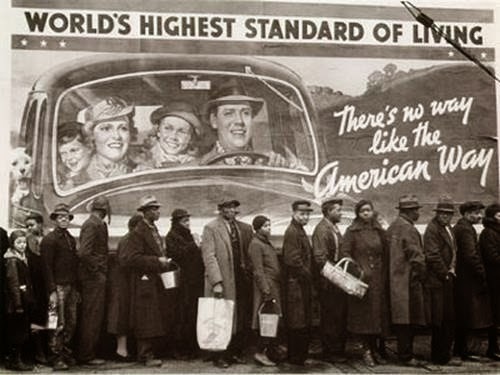 When each American is provided sufficient food, clothing, shelter and health care for themselves and their family, through whatever combination of private and public effort, America can say it is “great”, but not before. This “American greatness” is to be found and gained on the road ahead, not on any leading to the past. “Fortune Global 500”. Fortune. 2015. “State Minimum Wages | 2016 Minimum wage by State”. National Conference of State Legislatures. Jan. 1, 2016. “1.2 million Walmart workers to get pay raise”. Hadley Malcolm. USA Today. Jan. 20, 2016. “Income and Poverty in the United States: 2014 – Highlights”. U.S. Census Bureau. “How we can save $17 billion in public assistance—annually”. David Cooper. Economic Policy Institute. Feb. 18, 2016. 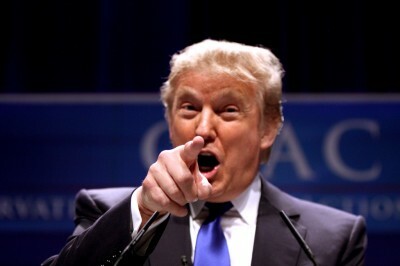 “Donald Trump kicks off GOP debate by saying American wages are ‘too high’”. The Week. November 10, 2015. “After Sanders criticism, Donald Trump flip-flops: US wages ‘are too low’”. Jana Kasperkevic and Edward Helmore. Guardian. Dec. 28, 2016. “Trump would tax Carrier air conditioning units for moving to Mexico”. Ginger Gibson. Reuters. Feb. 14, 2016. “Americans are spending $153 billion a year to subsidize McDonald’s and Wal-Mart’s low wage workers« . Ken Jacobs. Washington Post. Apr. 15, 2015. “Wal-Mart to close 269 stores as it retools fleet”. Krystina Gustafson and Courtney Reagan . CNBC. Jan. 15, 2016. “Walmart’s fiscal year 2016 total revenue”. Walmart. Feb. 18, 2016. Michael T. Bucci is a retired public relations executive who currently lives in New England. He has authored nine books on practical spirituality collectively titled The Cerithous Material.